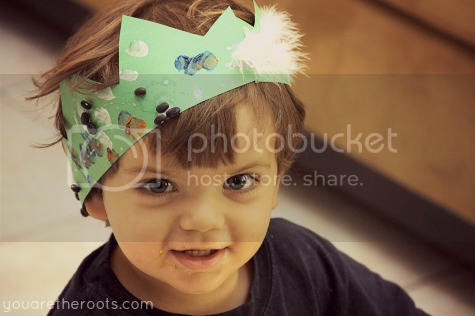 Ethan is really starting to get into dress up play. 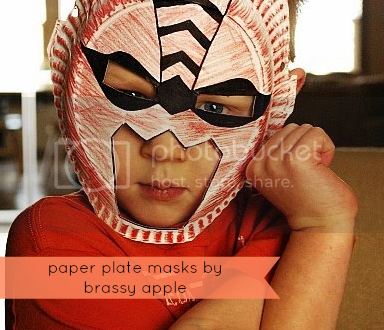 He loves to make crowns and wear masks or costumes. 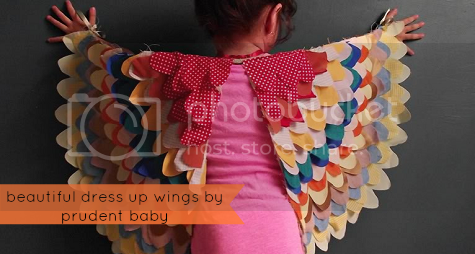 Dress up and imaginative play has become a huge part of our daily routine. 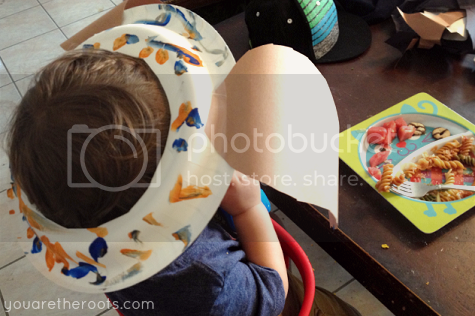 I had made Ethan a hat from a paper plate (that he painted) a couple of months ago for our color unit wrap-up in tot school and he absolutely loved it. 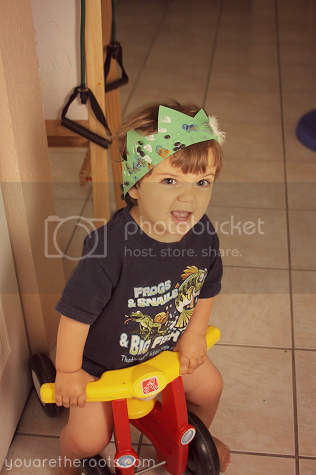 He wore that paper plate hat until it's fateful demise one afternoon. 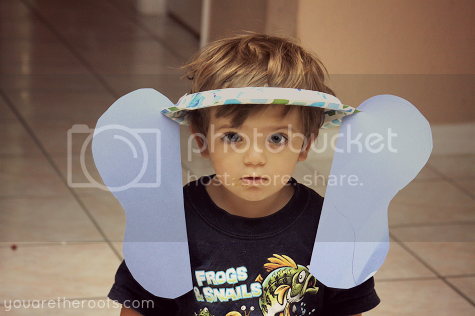 Since he loves animals, I thought it would be fun to decorate these paper plates as "animal hats" (as Ethan calls them). 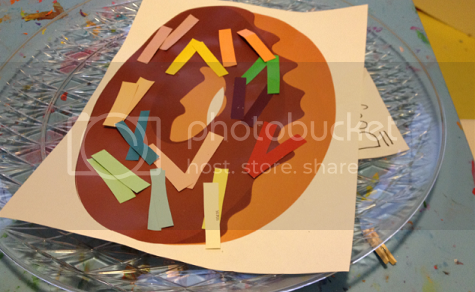 This lead to a great deal of fun, imaginative play! Yesterday, we made a "dog hat" and a "cat hat." 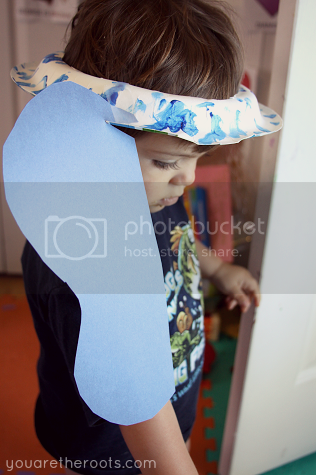 I cut the ear shapes from construction paper in about thirty seconds while Ethan was busy painting his hats. 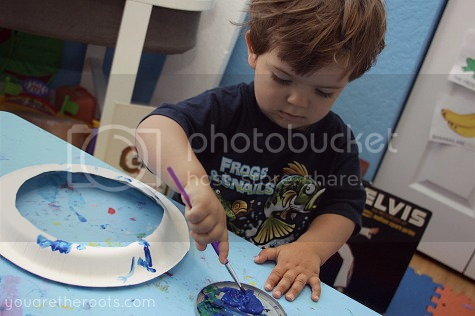 I love listening to him determine which color he's going to paint each animal, like a blue cat or a purple dog is the most rational thing in the world. 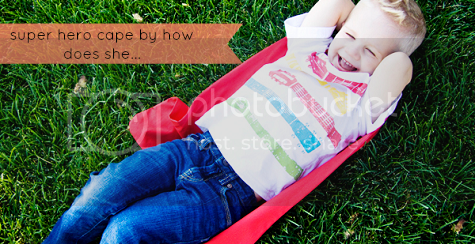 Kids are so awesome that way. Once I attach the ears, it lead to a fun afternoon of play. 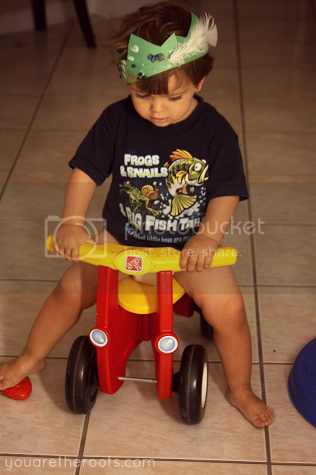 Ethan spent a good forty minutes yesterday being a cat, wearing his "cat hat" and following our cats around meowing. Today while I made him model our animal hats to make up for pictures that were lost in yesterday's technical glitch, he most enjoyed being a "puppy doggy." He thought it was the funniest thing to be a "puppy doggy" and eating lunch like a person. Since we just kicked off "E" week in tot school, I thought we could make a quick re-do today with an animal relevant to our tot school theme. An elephant it was! The cutest elephant in all the land, if I do say so myself! 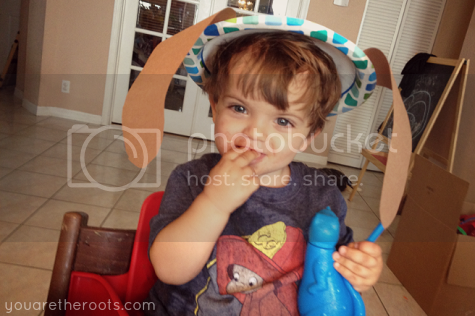 ;) We spent the morning doing our "E" week tot trays with Ethan being an elephant. 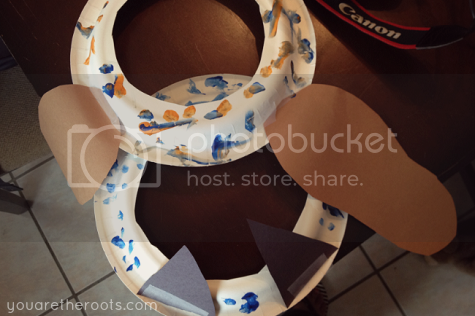 Yesterday we also made another crown. Ethan's "C" week crown still sits in his dress up/costume bin and he still loves to wear it, but it's always fun to add more! 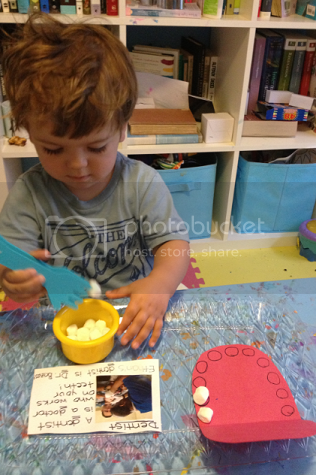 Yesterday he was interested in making his using paint, feathers and some...black beans, which he found in one of our tot school drawers. 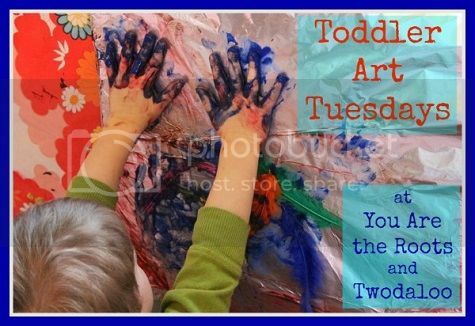 Don't forget to check out Twodaloo and see what Stephanie and her little ones have come up with this week! When the folks at Sibu contacted me about doing a review and giveaway of one of their products, I was pretty excited. I'm all for trying new, natural products on my sensitive skin, and I was especially excited because Sibu was unlike any other product line I've tried or used in the past. 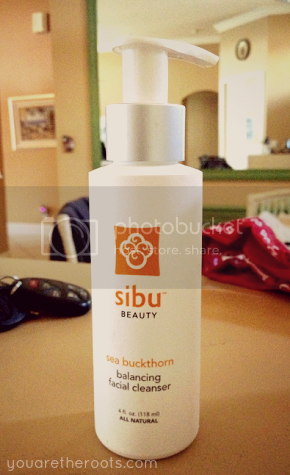 Sibu's products are made using Sea Buckthorn Berry, which is a rare fruit that grows high in the Tibetan Himalayas. It withstands the elements simply because of the nutrients it's packed with -- like Omega 7 and Omega's 3, 6, and 9. These all work hard to provide cellular support for healthy skin, hair and nails. 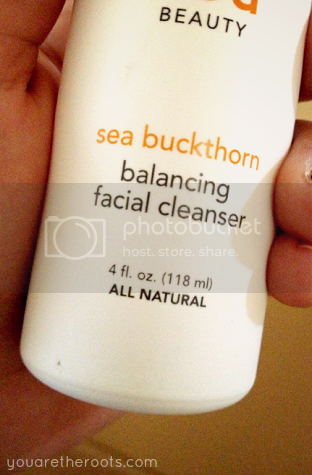 The product I reviewed was the Sea Buckthorn Balancing Facial Cleanser. I was eager for it to arrive and to start putting it to use. Here's a little confession: I'm guilty of not taking the best care of my skin and I really don't have the kind of skin you can just ignore. Sometimes splashing my face down with water and patting it dry is all I can muster as far as make-up removal goes at the end of a hectic day and, well, it shows. Plus, with all the time I spend out in the sun, my skin tends to form red patches, especially on my cheeks. From the first use, I couldn't believe how clean my skin felt. The facial cleanser is actually a clear gel containing nutrient-rich powerhouses like sea buckthorn berry extract and sea buckthorn seed oil and with the most subtle, clean fragrance that comes from orange and lemon essential oils. A little bit goes a long way and works up quite a lather. Just a tiny drop was able to lather up my entire face and upper neck area. 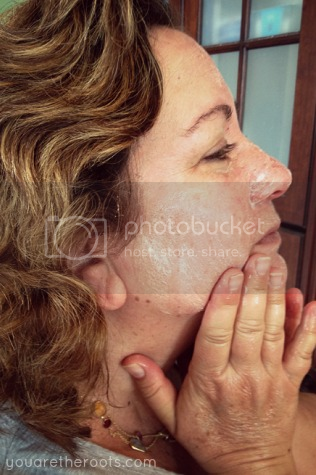 I loved the lather, which you typically don't get from gel facial cleansers. I also noticed that my face felt cool and clean as I washed it. The cooling feeling felt great on my skin after a long night at Body Back and the jojoba oil in the cleanser left my skin feeling soft after washing. I don't want to call this product an "exfoliator" and insinuate it's not for everyday use, but you could ever so subtly feel the gentle micro-particles cleaning deep into your skin. It's gentle enough for it to not feel like a scrub, but simply leaves your pores feeling clean. In addition to completely removing make-up without the help of pore-clogging make-up towelettes or oily make-up removers (which I can't stand using), this facial cleanser worked like a miracle to reduce my typical redness in the cheek area. 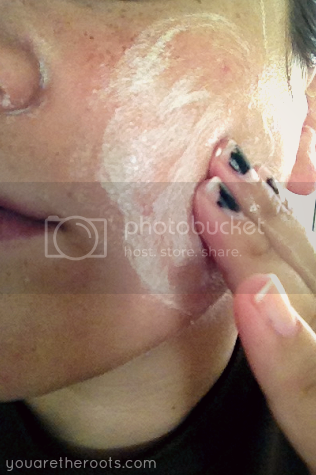 After using the facial cleanser for two weeks, I was able to tell a drastic difference in the overall tone of my skin. So much so, that I haven't even worn the translucent powder make-up that I typically apply on my face every single morning for over a week. Something I haven't really talked about is the fact that my mother had a skin cancer spot removed from her head a few months ago. While she's okay, the dermatologist put her on "take better care of your skin!" patrol and I've been sort of fronting that committee by bringing home all sorts of random skin products for her to try. As soon as I had my first experience with this Sibu cleanser, I knew this would be one that I'd insist she use. The Sea Buckthorn Berry contains up to 40% of Omega 7, which works hard to repair sun damaged and dehydrated skin (among it's other many GI and cardiovascular benefits), which would be perfect for my mom's skin. HOW TO BUY: Browse all of Sibu's fabulous (cruelty-free and vegan) products and start your shopping on their website! ENTER TO WIN! The fabulous folks at Sibu have offered one of my readers the chance to win a bottle of their facial cleanser! 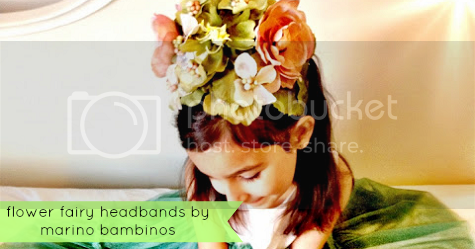 The giveaway is open to US/CAN residents who have not previously won a Sibu giveaway! Good luck! D week was an absolute blast for both Ethan and I. I wasn't sure it would be that way, given the fact he was pretty sick early in the week. (And with a sick toddler comes a disgruntled mother, so I apologize for the fact that every photo this week was taken on my phone. 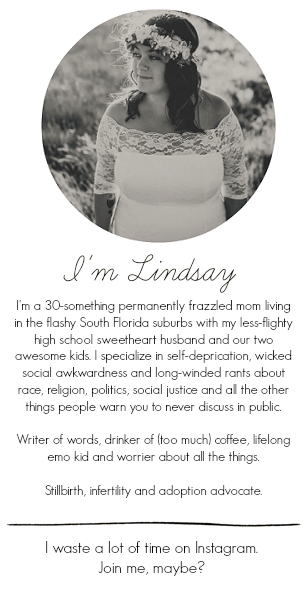 I cringed upon realizing this and promise it won't happen again!) Instead of being sick and miserable, he was content sitting in tot school for hours upon hours each day just doing his tot trays and working quietly with me. 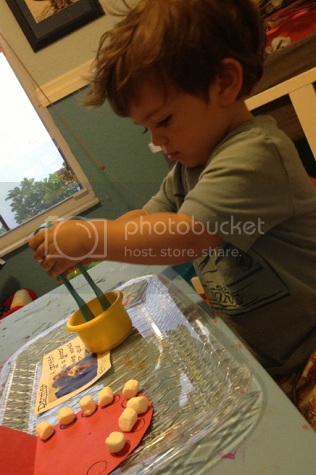 I'm not sure if it was his mood or the trays just happened to be extra fun this week, but Ethan woke up asking for tot school and went to sleep talking about tot school! It was a great week. I came up with this idea last minute and Ethan really enjoyed it. It was just for fun and so after a couple of days, the thrill sort of wore off a little. 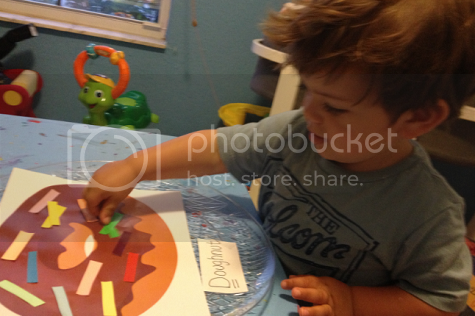 Behind each door was something that began with the letter D.
This tray was one of Ethan's absolute favorites. 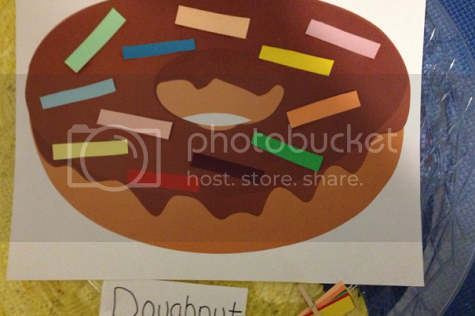 I had printed a full page stock photo of a doughnut and used paint swatches to create the "sprinkles." I cut two equal size sprinkles from each set of swatches. 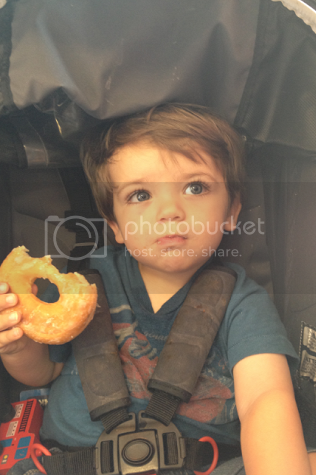 Ethan got to match the duplicate sprinkle to the one glued to the doughnut. 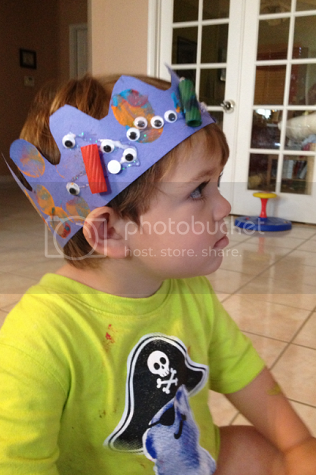 This was a great activity in the sense he got to match shades in addition to just basic colors. Each sprinkle also had a varying color shade somewhere on the doughnut. He had a little bit of trouble with the light pink and light purple shades, but eventually was able to figure it out. 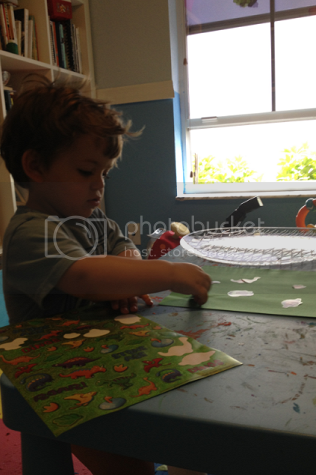 He really loved this activity. Ethan really loved the sensory bin this week. 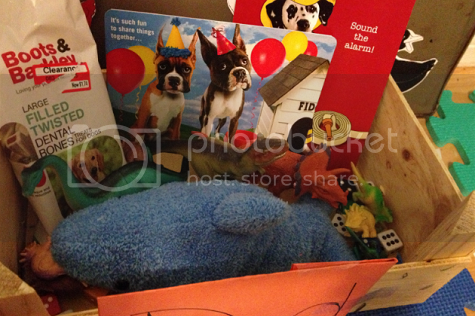 I had filled it with dice, a dolphin, dog bones, dog photos and -- his favorite -- lots of little dinosaur figures that I found at the dollar store. 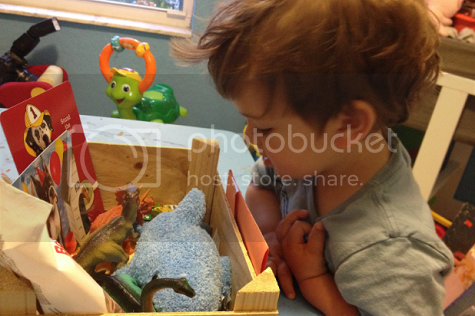 The dinosaurs were his absolute favorite part and he played with them endlessly. 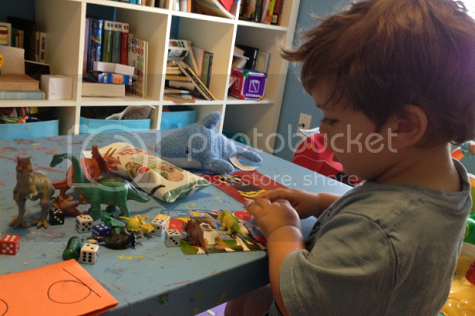 He also had some fun stacking and organizing the dice, which was fun to watch. One of Ethan's favorite things to do is feed the ducks at a nearby lake on our morning walks. 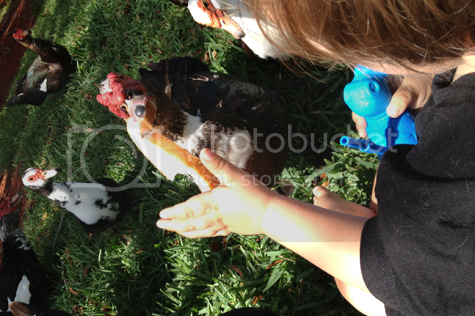 If you ask him what his favorite animal is, he happily exclaims that it's a duck. I knew I wanted to make a duck activity but wasn't sure just what, especially when I struck out finding rubber duckies at a few different stores leading up to D week. 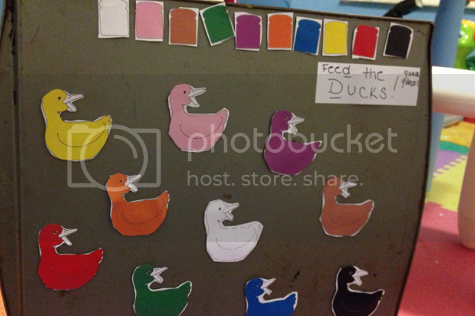 In the end, I printed out some different colored ducks, fixed magnets to the back and stuck them on an old cookie sheet. 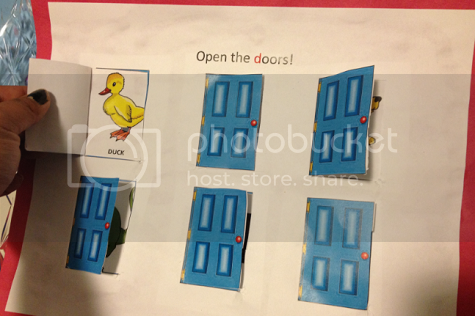 I printed out corresponding colored pieces of bread, also with magnetic backing, and let Ethan feed the ducks by matching the bread to the similarly colored duck. 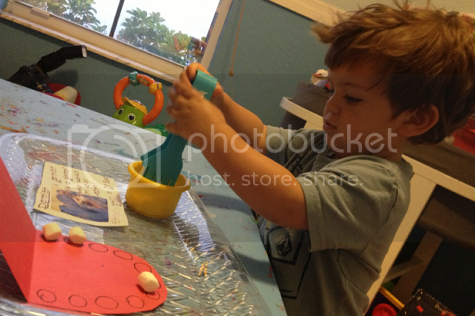 He had a lot of fun with this activity. Alright, hands down this was Ethan's favorite tot school activity ever. This was our second time using tongs -- the first time being a total bust a couple of months ago. 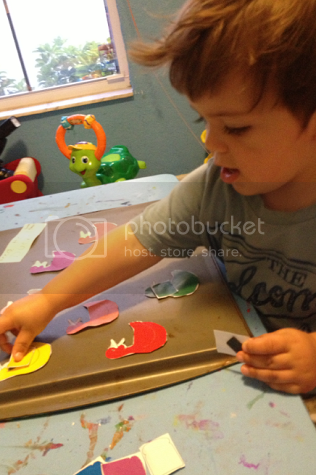 Ethan had trouble at first, but he loved this activity so much that he just flat-out refused to give up and strangely didn't get frustrated at all. I had included a picture of Ethan during his first dental cleaning to explain what a dentist was and he absolutely loved pointing to himself in the picture. 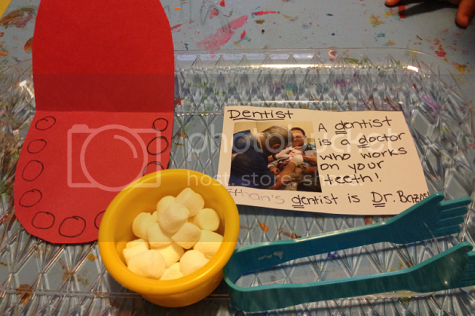 The point of this tray was to use the tongs to place the marshmallow "teeth" onto the circles on the mouth. The first day we did this tray, he played it for an hour and a half. It wasn't until the end of the week when he realized that the teeth were edible and delicious that his love for this tray fell second to his love of eating the "teeth." But, really, if ever there was a tot tray hit -- it was this one. 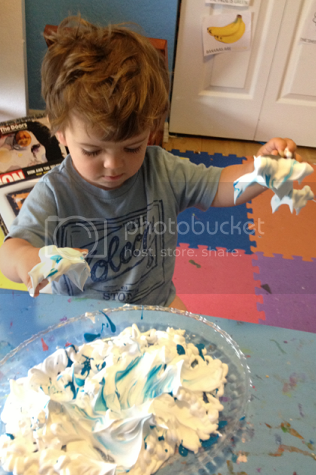 I found a plastic dolphin toy at the dollar store and made an "ocean" out of blue fingerpaint and shaving cream. 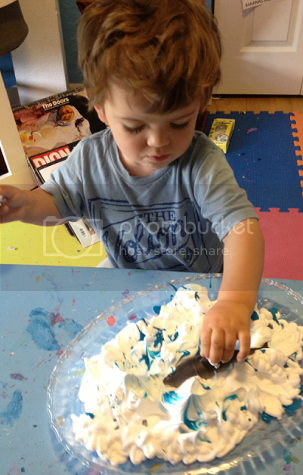 Ethan had a blast playing with the dolphin and pretending it was swimming through the shaving cream ocean. 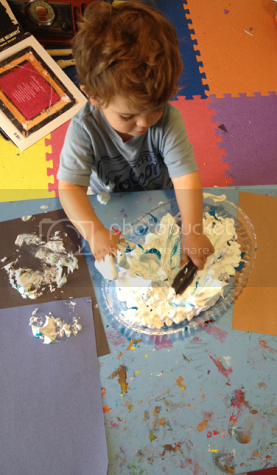 He ended up covered in shaving cream rather quickly, but kept asking for pieces of paper to stamp his hands on. For the first time ever, I'm a little shocked to say we didn't really have very many special art projects! 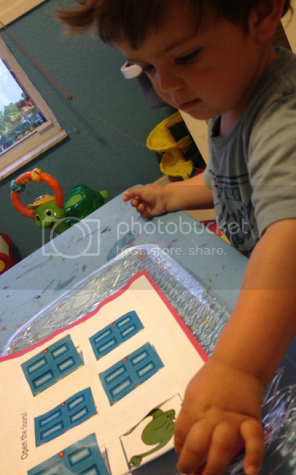 Ethan was so wrapped up in this week's tot trays that he didn't really express any interest in doing more than simply painting on some D-themed print-outs from TwistyNoodle. I suggested quite a few projects but was shot down each time by a preference of "dinos!" and "dentist Ethan teeth!" 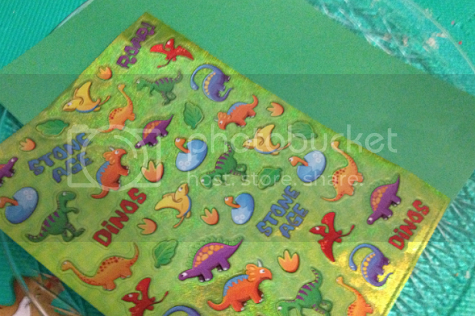 I did find a sheet of dinosaur themed stickers at the dollar store and Ethan had fun sticking them onto some construction paper here and there. 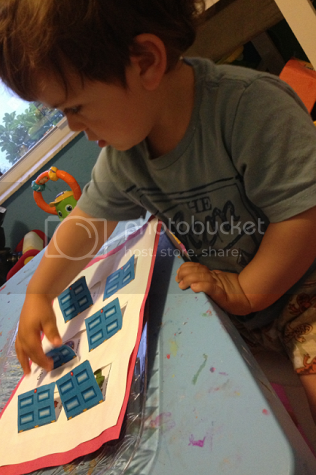 The stickers were big enough where he could peel them without them getting stuck to his fingers, and he really enjoyed doing this. 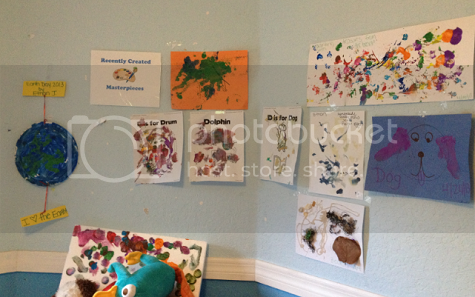 Most of the art displaying on our masterpiece wall is leftover from last week's Toddler Art Tuesdays feature! Ethan was in a little bit of an art rut this week, aside from asking for me to paint his feet which I gladly did -- and we turned his feetprints into puppy dog ears! 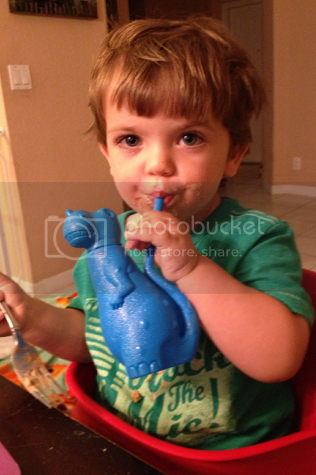 I had found a dinosaur cup at the grocery store and picked it up for Ethan in preparation for D week. As it turns out, he's obsessed with "dino wa-wa" and the cup travels with us wherever we go. Since Ethan wasn't feeling well, we spent a lot of time getting some fresh air on walks around the neighborhood. This included both stopping to feed some ducks and having a special doughnut treat on one of our walks! I also made some changes to our listening station. 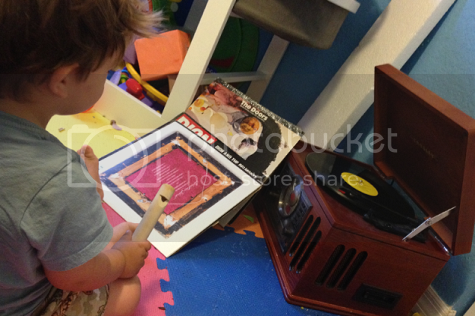 In addition to featuring albums by artists who begin with "D", I found some little wooden instruments at Target and Ethan and I had a blast playing along with the music on the record player. 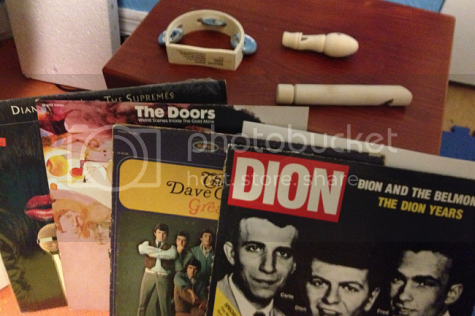 He really enjoyed most of the "D" week music that I had lined up and especially loved playing his tambourine to the beat of the song that was playing. Adding the little instruments to our listening nook really livened things up and this became one of Ethan's favorite parts of our days!